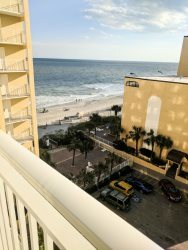 This studio condo sits on the 5th floor of the Driftwood Tower at the Sea Mist Resort. The condo is fully stocked with towels, linens, cookware, and all furnishings.The efficiency contains two queen beds, a full bathroom and a full kitchen. You also have a private balcony where you can enjoy amazing views of the Atlantic ocean. Please note that this is an older resort (over 60 years old) and decor may reflect that. Max occupancy with added cot is 5.